What should a bedroom be if not a cheerful sleep sanctuary? Capree from Curbly got all that with colorful eclectic decor and dual-function shades that allow her to block light or let it in on a whim! Curlby is a DIY decor wonderland. Their contributors are avid DIYers who have tried it all and break any project down into simple, doable parts. We’re crazy about their blog and have loved working with them on the original Curbly House and a partnership with Emily Henderson: Home Blog Curbly Gets Blinds.com Makeover + $1000 Blinds Giveaway and Love Triangle: Emily Henderson + Curbly + Blinds.com. Dual function shades were exactly what Capree of Curbly was searching for when remodeling her eclectic style bedroom. After speaking with Blinds.com Designer Josh, she found the Premium Blackout Cell Shades to be a great choice with awesome hidden features. Because the position of the bedroom doesn’t let in as much light as Capree would like, she painted her room a pale, matte pink to brighten up the room. Adding colorful pieces like pictures, terrariums and a color block duvet brought life into the space. Depending on Capree’s preference, she can have a shade that lets in natural light or a complete blackout shades for a private, insulated, dark room great for relaxation and sleep.The trilight option gives you 2 shades in 1. On top is a sheer pleated shade that lets in lots of light,while protecting furnishing from UV rays. Below is a blackout cellular shade that turns the bedroom into an ultimate sleep cave. Either fabric can be expanded to cover the entire window or anywhere in between for adjustable light control. These shades also have fabric coating on the head, medium and bottom rails that match the rest of the shade. They’re the perfect choice for a bedroom that needs lots of versatility. 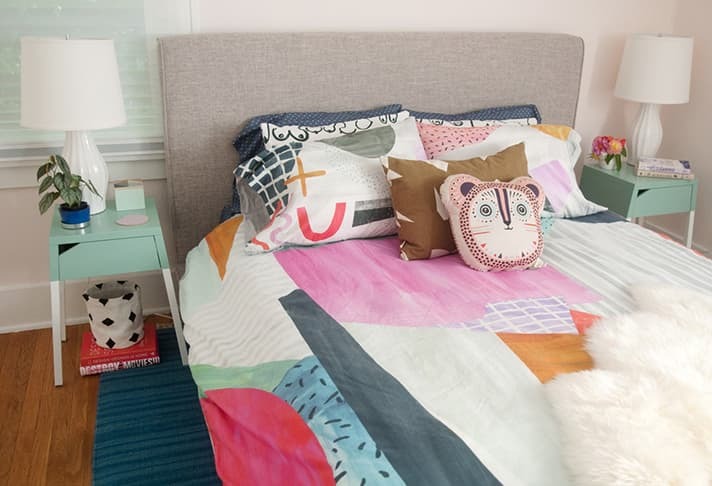 To learn more about Capree’s bedroom makeover, check out her blog post, 29th Avenue, A Colorful Master Bedroom Makeover Part II – The Big Reveal! Capree chose the 3/4″ single cell Premium Blackout Cell Shades in the color Honey White for the blackout lower portion and White for the sheer Trilight fabric.